New Drugs for CML – Can we improve the future outcome of CML patients? 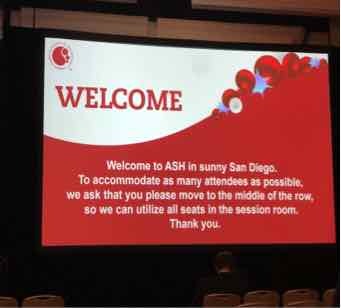 At this ASH we have heard abstracts about 4 new drugs in CML. Only one of them is developed by a big global Pharma, and 3 are developed by smaller biotech companies in South Korea, Russia and China. Interestingly 3 of the 4 drugs show efficacy against the T315I mutation and at least 2 of them were specifically designed to target this mutation. Radotinib (INN; trade name Supect), is a drug for the treatment of CML being developed by Ilyang Pharmaceutical Co of South Korea. This poster summarized the 4 years results from the Phase 3 ReRise clinical trial for newly diagnosed CML patients in South Korea comparing Radotinib 300 mg twice daily to Imatinib 400 mg daily. 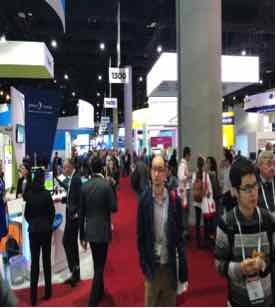 The responses to Radotinib were deeper and faster compared to the Imatinib arm. After 4 years 76 % of the patients on Radotinib achieved MMR compared to only 56 % on Imatinib. 46 % reached MR4.5 on Radotinib compared to 33 % on Imatinib. However, there was no difference in overall survival and PFS between the 2 arms. There were no new safety issues reported on Radotinib and especially no Cardiovascular events. The paper concludes that Radotinib may have a higher possibility of treatment-free remission (TFR) on frontline therapy as well as it can be one of the standards of care in newly diagnosed CML-CP. It was interesting to hear from CML experts at the posters that even though Radotinib has similar efficacy to 2 ed generation TKIs and its price is cheaper, they don’t think it will be marketed outside of South Korea or some neighbouring Asian countries. PF-114 is a 4th generation TKI with a closer structure to Ponatinib. It was designed to avoid inhibition of numerous off-target Kinases and thus reduce life-threatening side effects. The Phase 1 trial recruited 51 CML patients who have failed at least 2 previous TKIs. The trial tested escalating doses from 50-750 mg and the maximum tolerated dose was found to be 600 mg once daily taken orally. Optimum efficacy\safety ratio was found for doses of 200 and 300 mg. The main side effect was skin disorder with Psoriasis-like lesions. It showed efficacy against the T315I mutation with no cardiovascular toxicity. A phase 2 multicenter international study is planned for 2019. This oral presentation was given by Dr Qian Jiang from China who will also be a speaker at our CML Horizons 2019 in Kenya. HQP1351 is an orally active potent inhibitor against many mutations including the T315I. The Phase 1 trial in China was single agent dose escalation for TKI resistant CML patients in Chronic (58 patients) or accelerated phase (12 patients) that haven’t been treated by Ponatinib before. The maximum tolerated dose was found to be 50 Mg. The drug was well tolerated and highly active in CML patients including those with the T315I mutation. At a median follow up of 7 months 96 % of CP and 85 % of AP patients achieved complete haematological response and interestingly the patients with the T315I mutations achieved better responses. Main toxicities were Thrombocytopenia and skin pigmentation. Since the T315I mutation is resistant to all available TKIs except Ponatinib which is associated with cardiovascular toxicity, additional treatment options are needed. Asciminib differs from other TKis as it doesn’t bind through the ATP and has shown activity against non-mutated and mutated BCR-ABL including the T315I in preclinical studies. 32 CML patients with the T315I mutation were recruited to the phase 1 study. After 15 months almost 37 % achieved MMR and 20 % MR4.5. The optimum efficacy dose was found to be 200 mg twice a day. Asciminic monotherapy shows promising efficacy and favourable safety profile in patients with T315I mutation in CP and AP. The most frequent any-grade Adverse Events were arthralgia, fatigue, lipase increased, and nausea. The authors conclude that Asciminib may represent a new option for patients with CML and the T315I mutation who are not eligible for Ponatinib or have failed Ponatinib treatment. This trial is still recruiting. 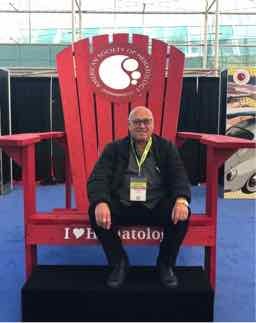 Stopping treatment in CML patients- selected abstracts and findings. This was an interesting abstract as it has for the first time presented stopping treatment outcome in 236 CML patients outside clinical trials, in real life in Spain. The average age of the patients at diagnosis was 50 and at stopping 61, which means most of them were many years on treatment. 78 % had previous 1 TKI, 14 % 2 TKIs and 8 % 3 TKIs. 74 % were on Imatinib when treatment was stopped, 18 % on Nilotinib, 7 % Dasatinib and few on Ponatinib and Bosutinib. At 4 years after stopping 64 % were still on TFR which is higher than the number we have seen at clinical trials of TFR. The latest relapse occurred 30 months after stopping treatment. 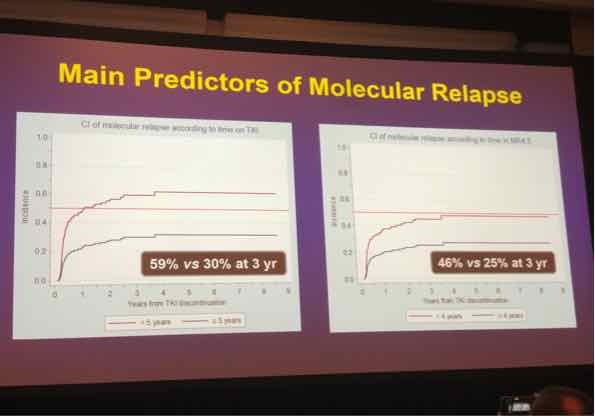 Duration of TKI treatment of fewer than 5 years and time in RM4.5 shorter than 4 years before TKI discontinuation were both significantly associated with a higher incidence of molecular recurrence. The authors recommend paying special attention to Cholesterol levels increase observed after Imatinib cessation. This international multi centres stopping treatment for Imatinib CML patients study recruited 112 patients and digital PCR was done at the beginning and one more time during the study. The results after 79 months were presented. The main findings were that long-term monitoring is essential as late relapse occurred also during the 4th year after stopping. Interestingly younger age of less than 45 was found to be associated with higher relapse rates. These interesting but very preliminary results are from a Canadian study of trying a second stopping with the use of Dasatinib in 131 patients who failed stopping with Imatinib. The study was aimed to find if we can improve TFR2 by using 2 ed Generation TKI after failing 1 st attempt with Imatinib. So far 25 patients who received Dasatinib and reached MR4.5 for 12 months, stopped treatment. 21 of them lost molecular response within 3.7 months. This trial has not yet confirmed that Dasatinib can improve TFR2 rate after Imatinib discontinuation failure. There is a need to discuss and see if more strict criteria might be needed for TFR2 like a deeper molecular response of MR5.5 or longer duration on deep molecular response than the 1 year used in this trial. This Korean stooping study recruited 126 patients with minimum 3 years on Imatinib and minimum of 2 years undetectable PCR. After a median follow up of 43 months 55 patients (44%) lost MMR. Out of 53 patients who resumed Imatinib 51 achieved MMR again. However, in this trial, there was one case of a patient who was 10 years on Imatinib and 2.5 years on sustained undetectable PCR before stopping. He relapsed 53 months after stopping treatment, regained MMR quickly but 6 months after restarting treatment transformed into blast crisis. We know that this is a very rare case out of more than 2000 patients who stopped treatment on clinical trials. Although sudden blast crisis occurring in responding patients with CML has already been reported in Imatinib therapy, an event of progression to BC in a clinical trial of Imatinib discontinuation deserves to be followed-up with caution. Due to lack of data on the topic of CML male conception and female pregnancy on different TKIs, The Italian CML working party, GIMEMA, initiated in 2013 a retrospective\prospective study whose aim was to describe the outcome of these patients. The questions addressed were related to the pregnancy, to CML therapy and the babies outcome. 137 patients were analyzed, 83 males and 54 females. There were 168 pregnancies/conceptions (106 male, 62 female). For 5 women CML was diagnosed during pregnancy, 2 elected to do abortion, 1 was treated with Interferon and 2 were only observed. The 3 children were born with Cesarean Section. For all female who got pregnant, their TKI was stopped. All patients that lost response due to TKI cessation, and restarted treatment, regained their remission. The main conclusions so far are that it is feasible for men and women with CML to plan and successfully accomplish conception and pregnancy. There is a very limited concern in regards to fertility, conception and delivery for female partners of males with CML while female patients should stop any TKI at first pregnancy test positive and no treatment should be administered until 13-15 weeks of pregnancy. After this period and after Placenta is formed TKI with low placental penetration (Imatinib or Nilotinib) can be considered and Interferon can also be used. Babies born from a CML parent do not present differences from similar group population. One of the main challenges of young CML female patients is the need to stop TKI treatment during pregnancy. There are many issues related to this including what response level they need to have before stopping and the pace they regain their MR after restarting treatment. This important work by leading CML experts like Jane Apperly and Ekaterina Chelysheva was done to analyze the loss and recovery of molecular response in CML pts with initial major molecular response (MMR) and deep molecular response (DMR) who had TKI interruptions during pregnancy. Data was collected from the Russian pregnancy registry and other institutions database. 87 cases were eligible for analysis and were divided into 3 groups: 39 with a deep molecular response and stop criteria, 26 with DMR but no stop criteria and 22 with MMR only. The authors conclude that CML patients with DMRand “stop” criteria have the best chance to keep MMR during pregnancy after TKI cessation and may remain without treatment after labour. MMR is lost in the majority of patients with MMR/DMR and no “stop” criteria. However, the loss of response is reversible and MMR can be recovered within 1-2 years after TKI resuming in spite of even MR2 loss. The data confirm the option for planning pregnancy not only in CML patients with stable DMR but also in patients who have an MMR only or non-stable DMR followed up by a careful molecular monitoring during and after pregnancy. This abstract studied the outcome of pregnancies in Bosutinib treated patients. The study included 33 cases, 17 of a CML male and 16 females. This paper describes what happened in the sample of pregnancies where the father or mother took Bosutinib. Out of the 16 female pregnancies 5 healthy babies were born, 2 elected to terminate the pregnancy, 2 babies died before birth and 7 pregnancy outcomes is unknown. From the 17 male pregnancies 9 healthy babies were born, 4 elected to terminate the pregnancy, 1 baby died before birth and 3 pregnancy outcomes were unknown. Even though the study did not reveal safety issue with pregnancies on Bosutinib, the authors conclude that Bosutinib is not recommended for use during pregnancy, and patients on bosutinib treatment should use effective contraception.